MAASTRO Clinic is the first HYPERSCAN Pencil Beam Scanning Center in Europe. LITTLETON, Mass.--(BUSINESS WIRE)--The Zuid-Oost Nederland Protonen Therapie Centrum, (ZON-PTC) at the MAASTRO Clinic in Maastricht, the Netherlands has become the first center in Europe to provide proton therapy to patients utilizing a compact, single-room system. The center features the MEVION S250i Proton Therapy System® with HYPERSCAN® Pencil Beam Scanning and an integrated in-room cone beam CT system, the ImagingRing™* from medPhoton. Proton therapy is a superior form of radiation therapy that can reduce the amount of unnecessary radiation exposure to surrounding healthy tissue and sensitive organs at risk. HYPERSCAN Pencil Beam Scanning improves on these benefits by utilizing an adaptive multi-leaf collimator to sharpen the beam and enable a more precise and conformal dose to the tumor than ever before. 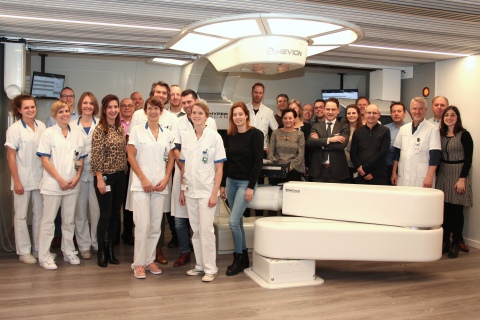 “Proton therapy is an important tool in cancer treatment, and we are excited to now offer this advanced form of proton therapy to patients who need it most,” said Geert Bosmans, managing director of ZON-PTC. Mevion’s streamlined installation allowed the clinicians at ZON-PTC to begin treating patients in less than a year from cyclotron delivery. Moreover, with the industry’s smallest footprint, the proton system was directly embedded into the radiation therapy department in a narrow space between two clinical buildings. This enables ZON-PTC to share existing resources and expand the treatment options available at the MAASTRO Clinic. Adoption of proton therapy has been expanding rapidly because of the development of compact proton therapy systems. Today, new proton therapy systems are almost exclusively compact single-room systems. Mevion was the first company to innovate this new approach to proton therapy and provides the most compact system available today. *The ImagingRing from medPhoton is 510(k) pending and has not been cleared by the US FDA for clinical use. Mevion Medical Systems, Inc. is the leading provider of compact proton therapy systems for use in radiation treatment for cancer patients. Mevion is based in Littleton, Massachusetts, with a presence in Europe and China. For more information, please visit www.mevion.com.